Losing someone you love is always heartbreaking, but the pain is only amplified when the victim is a young child who had their whole life ahead of them. An example can be found in the tragic accident that occurred on Florida’s Turnpike in Southwest Miami-Dade where a 5-year-old girl lost her life. The young girl was a passenger in a Jeep Liberty being driven by a 22-year-old woman and occupied by another woman and three children. A semi-trailer suddenly began to close in on the Jeep, according to investigators, which then caused the driver of the Jeep to brake to avoid a collision. This caused her to lose control causing the vehicle to roll over multiple times, according to The Miami Herald. Four of the occupants in the Jeep suffered serious injuries and, sadly, the 5-year-old girl passed away due to the severity of her injuries. If you were injured or you lost a loved one in an accident caused by a truck, a Miami personal injury attorney can help you file a civil lawsuit to pursue financial restitution for the expenses you have been saddled with as a result of the collision. claim is filed against the truck company that owned the actual big rig, in addition to the truck driver. 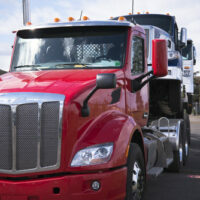 The truck company is liable due to a long-standing legal principle known as respondeat superior. This is a legal term that essentially means an employer is responsible for the negligent acts of their employees if the acts are committed while the employee is performing a work-related duty. When a truck operator is hauling materials on a road or highway, they are within the scope of their employment. If you are contemplating taking legal action against a large truck company, do not go it alone. Truck accident injury claims are some of the most complex and heavily litigated in the field of personal injury law. As mentioned, there are likely multiple parties who may be liable for your injuries. Nevertheless, it is quite common for defendants to deny fault and refuse to agree to a fair and reasonable settlement. This is where an experienced and skilled attorney can be of service. They can go to work for you collecting evidence from the crash, contact witnesses, retain experts, review your medical records, and take other actions to help strengthen your injury claim. Having an attorney on your side is also beneficial because, following a serious collision, many truck companies immediately commence an investigation of the accident. Level the playing field by having a lawyer investigate the wreck on your behalf. Now is the time to reach out to an attorney to schedule a free case review. In Florida, there is a statute of limitations for all civil claims so you only have a finite period of time to file a lawsuit. The Miami injury lawyers at the office of Alan Goldfarb, P.A. are ready to help.